List of Author(s): Aguiar BBD, Pereira T, Martins A, Pereira M, Costa M.
Copyright: © 2018 Aguiar BBD This is an open-access article distributed under the terms of the Creative Commons Attribution License, which permits unrestricted use, distribution, and reproduction in any medium, provided the original author and source are credited. A 16-year-old female adolescent was brought to the emergency service due to chest and neck pain on her left side which was sudden onset, sharp and of moderate intensity. The pain worsened when she inhaled deeply. No other symptoms were described. She was previously diagnosed with an anxiety disorder and was on treatment from a psychologist and a child psychiatrist. During the physical examination, she had pain when left sternal palpation was undertaken. The pulmonary auscultation and the rest of the physical examination was normal. Her oxygen saturation was 100% at room air and she was hemodynamically stable. Due to the physical examination as well as the medical history presented she underwent a chest x-ray, gasometry and analytical study (Figure 1,2). Chest x-ray showed hypo transparency of the Paracardiac mediastinum with a discrete air lamina involving the cardiac silhouette. Computed tomography scan revealed a pneumomediastinum affecting all compartments and extending to the cervical region with coexisting emphysema of the superior thoracic wall. 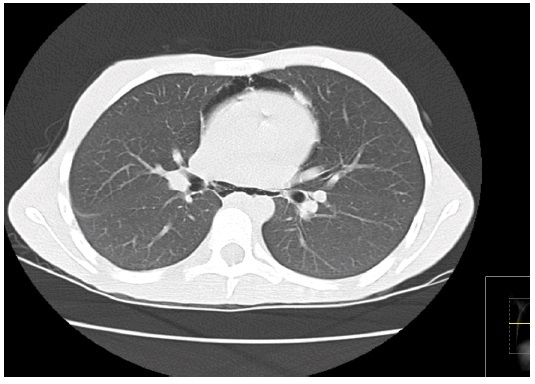 Pneumomediastinum results from the dissociation of the air of the pulmonary parenchyma within the mediastinum. It is commonly a self-limited process, without need of aggressive intervention and occurs mainly in male adolescents. The most frequent symptom is chest pain – which our adolescent reported . The most common causes are asthma exacerbations, bronchospasm, cough, respiratory tract infection and vomiting. These are activities that require the Valsalva maneuver . On further enquiry in our patient, it was found that the adolescent had been taught some respiratory exercises, which she did daily at home. After being questioned she recalled her symptoms has begun the day before, after she had done her respiratory exercises due to severe school-related anxiety. 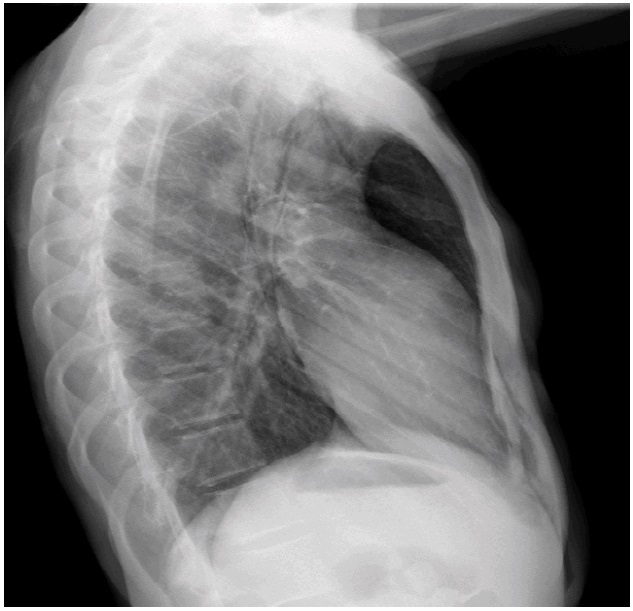 The diagnosis is confirmed by a chest x-ray, although it may be helpful to perform a CT-scan in order to better characterize the clinical condition as well as detect possible complications . The treatment is conservative and essentially symptomatic ; however, it is necessary to exclude and underlying pulmonary conditions. Prognosis is favorable in most cases.